New Hampshire claims 18 miles of coastline; shorter than any other state bordering an ocean. But author Jane Cleland makes full use of the sand and salt air in her Josie Prescott antiquing series. Our detective meets her best source of information on these dunes: the local newspaper reporter. Location and weather are often used to connote mood in a book; if obvious, they can jolt the reader, but if used judiciously add an air of comforting authenticity. Author Cleland proves masterful in incorporating these details into her story. 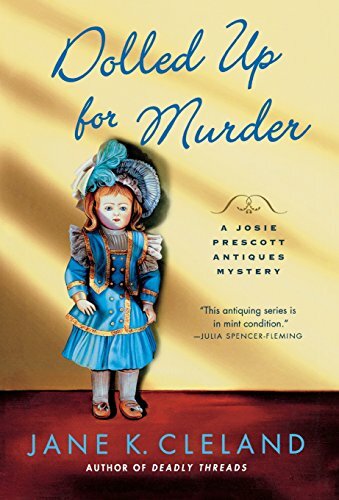 It’s May, the flowers blooming, the air scrubbed clean, and Josie is showing her latest find, a collection of dolls, to aficionado Alice Michaels. Alice, who runs a local investment firm, is on the verge of being accused of bilking her investors in a Ponzi scheme and apparently has some unhappy clients—she is shot to death in the Prescott’s parking lot. Shortly thereafter Eric, an employee of Josie’s, is kidnapped. The bad guy wants the doll collection as ransom. The best section of the book has Josie picking up clues the kidnapper has distributed around town, with increasing tension due to the time constraint, fear because Eric is depending on her, and humor as to where the clues are stashed. Unfortunately, the book lags a bit after this with dull suspects trotted out such as the son his dragon lady wife, investors etc. This series has accurately been described as the “Antiques Roadshow” of mysteries. Besides dolls, the reader learns about paper money, counterfeiting, and how the Union used money to support their troops in the Civil War. Josie is likeable and knowledgeable, a woman who runs her business with passion and precision. Her boyfriend is superfluous; he’s away in this book (although why he doesn’t come home when Josie is delivering a ransom is a mark against him)—but we don’t miss him regardless. Kathleen Hennrikus is an award-winning newspaper professional whose experience includes research, story development, conducting interviews, and book reviewing for The Boston Globe. She was also Research Editor and a writer for Boston Magazine.